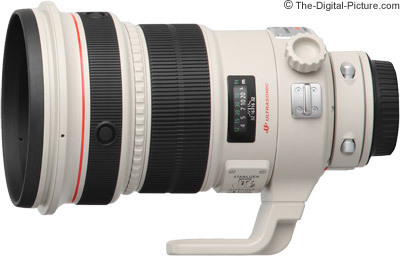 Amstelveen, The Netherlands, 24 January 2008: Canon today unveils two new professional EF lenses: the EF 200mm f/2L IS USM and EF 800mm f/5.6L IS USM. Equipped with Canon’s latest 4-stop Image Stabilizer, both models incorporate L-series lens optics and construction to deliver class-leading performance and operability. With its large f/2 aperture, the EF 200mm f/2L IS USM will appeal to photographers who require a brighter lens for indoor sports and portraiture photography. Improvements over the EF 200mm f/1.8L USM include a fluorite lens element for better elimination of chromatic aberrations, a circular aperture diaphragm and a significantly lighter, more compact design. The EF 800mm f/5.6L IS USM enhances Canon’s super telephoto range with the longest focal distance of any EF lens on the market. Light enough to allow for handheld shooting, it is expected to be popular with sports, news and wildlife photographers. Benefiting from UD and fluorite lens elements along with a raft of new optical technologies, both lenses offer professional photographers an exceptional degree of image quality – as standalone lenses and when combined with the Canon EF 1.4x extender. Both lenses feature environmental seals to protect against dust, rain and humidity. The 4 stop Image Stabilizer (IS) significantly extends the low light performance of both lenses. Photographers normally shooting handheld at 1/1000 sec can switch on IS to obtain a similarly steady and blur-free result with a shutter speed of just 1/60 second. For shooting immobile subjects, Mode 1 corrects for movement in the image along both the horizontal and vertical axes. For shooting while panning horizontally to follow a moving subject, Mode 2 turns off vertical correction and prevents the effect of dragging the subject back through the frame. IS switches off automatically when the camera is mounted on a tripod, thus preventing feedback loops between the IS sensor and internal motor vibrations. Both lenses incorporate a newly designed optical system that limits lens size while improving image clarity over the total image area. A combination of fluorite, UD (Ultra-Low Dispersion) and Super UD glass elements are used to eliminate the secondary chromatic aberrations that otherwise reduce sharpness and introduce colour fringing. Canon’s patented Super Spectra lens element coatings reduce reflections off lens surfaces, ensuring undistorted images with natural colour balance and minimal ghosting or flare. The lenses employ magnesium alloy components to significantly reduce weight and size. The EF 200mm f/2L IS USM has the lightest body in its class, weighing only 2.52 kg. Despite its longer focal length, the EF 800mm f/5.6L IS USM is a similar length to the EF 600mm f/4 L IS USM at 461mm, but weighs 860g lighter. In keeping with Canon’s Kyosei philosophy of living in harmony with the environment, the lenses feature only lead-free glass. Several features are incorporated to assist photographers in the field. The AF stop button at the front of each lens allows photographers to temporarily turn off auto focus. The button can be configured to control AF mode, IS, and AE lock with the EOS 40D, EOS 5D, EOS-1D Mark III and EOS-1Ds Mark III. The EF 200mm f/2 L IS USM and EF 800mm f/5.6 L IS USM also feature a focus preset function that electronically memorised a user-selected focus position – particularly helpful for sports or wildlife photographers.